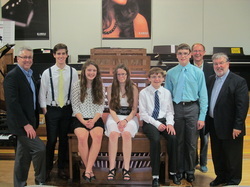 Many of our clients have expressed concern about finding organists in the future. We have undertaken several projects to help build interest and skills in local young people. A big stumbling block in the progress of young organists is having an organ available for them to practice on. They must depend on a church's availability and their own family schedule. Classic Organs has a 'fleet' of AGO standard organ consoles which we place on loan to young students. The student and their families pay absolutely nothing. Even the delivery fees are paid by Classic Organs. We are pleased to report that these students have shown great progress.